I've been playing with some cardboard lunch boxes that I recycled from the last day of school in June. 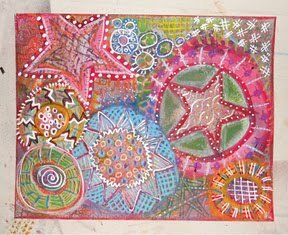 I gelli printed some and I painted some with alcohol ink, then I was wondering what else I could do with the boxes. I looked around my studio, trying to think up some ideas and decided to make a book within the box. These are all of the boxes. You can see the original in lower left. Click on the pic to get a larger view. The box in lower right is my book box, the others are empty. each signature has a cover of gelli printed file folder, folded and sewn. Another view of the spine. Here is my book box, all closed up. I still want to decorate the inside somehow, perhaps with colorful quotes and marks. We'll see. I'm pleased with it and can see that I will want to make more. Do you have any other ideas? I'd love to hear them. Thanks, Dana! I do miss you all but I must say that watching the bus go by in the morning while I eat my breakfast is awfully nice. These boxes were so much fun to play with.